Alright TPT friends, I'm going to try and make this tutorial easy because let me tell you...it took me about two hours before I finally perfected my quote box picture! I followed tutorials as well, but I work best in Microsoft PowerPoint and I just couldn't get everything looking perfect. I am *cough* somewhat of a perfectionist. There are other ways to do this, but this is what has worked for me! TO SKIP STEP 1 AND 2: you can download the template HERE. Open a new PowerPoint presentation and adjust your slide size to a width of 4.7 inches and a height of 1.5 inches. This size will eventually produce a JPEG image that is 450 x 150 pixels. Create you image! Try to use the space on the entire slide. Save your slide as a JPEG or PNG image. Now you will need to upload your image to the internet. I couldn't quite figure out the best way to do this, so I created a secret board on my Pinterest account and uploaded the image there. That way, it was on the internet but no one had to see it. Click on your image and then right-click to "save image URL." Your image URL will be pretty long, and there's just not enough room for such a long URL in the quote box. You need to go to a website like Tiny URL to make your URL smaller. Right-click and paste your URL into the box to make it smaller. 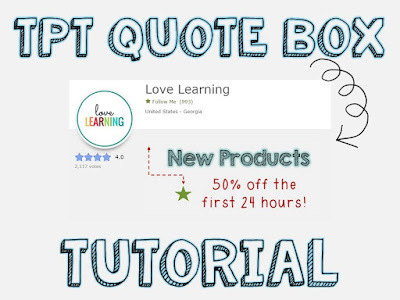 Log in to your TPT account. 1. Click on "My Account"
2. Click on "Store Profile"
Paste the following link into the "Personal Quote" box (with your information). Your product link will also need to be a tiny URL. If you have any questions, feel free to comment on this blog and I will do my best to answer them! What a great step by step tutorial! I will be using this post this afternoon to update my store. The tip about pinning it on a secret board is great! Andrea - this is AMAZING! I can't wait to tackle this project this afternoon. Thank you for making this so simple and foolproof! I have spent countless hours on my quote box. I have read several step by step posts. I have been close to sheddding a tear or two! Then I found YOU! THANK YOU!!! !